The phase-style effects created by these two new TC Electronic TonePrint-series pedals are anything but ordinary. Taking the Viscous Vibe first, this isn’t quite a phaser and is not quite a vibrato either. It is designed to replicate the sound of the Shin-Ei Uni-Vibe, a decades-old analogue modulation pedal that can be heard on a number of Jimi Hendrix tracks as well as on songs by Pink Floyd and others. If you haven’t heard a Uni-Vibe, its effect is best described as part phaser, part vibrato and part tremolo, with a rich character that doesn’t seem to ‘thin out’ during parts of the modulation cycle, as some phaser pedals tend to do. This classic sound is used on the beautiful Jimi Hendrix track ‘Little Wing’, for example. The Uni-Vibe was originally conceived as a rotary speaker emulation and while, rather predictably, it wasn’t really up to that extremely complex task, it offered up a unique sound and soon established itself as an effect in its own right. In the original, the modulation was controlled by an LFO feeding a complex lamp and quad-photocell arrangement. TC’s engineers claim that replicating the sound of this antique pedal using DSP was something of a challenge, and that getting it right virtually maxed out their most powerful pedal DSP chip! Although compact, the pedal has mono/stereo connections for both input and output along with a choice of hard bypass or active ‘buffered’ bypass (set via internal mini switches) and, of course, TC’s unique ‘TonePrint’ compatibility. TonePrint allows artist patches to be downloaded into the unit via an app for iPhone and Android (just hold the phone close to the guitar pickup) and also enables the user to edit patches of their own using the free TonePrint editor software (Mac/PC). Both the pedals reviewed here have two switchable modes of operation plus a third position that can be loaded with one TonePrint variation, though this is filled with a perfectly usable factory setting by default. Apparently, the dry part of the guitar signal always remains in the analogue domain to maintain a faithful tonality. Aside from the TonePrint setting, the two modes are labelled as per the original (Chorus and Vibrato), though neither sounds conventional. Chorus provides many classic Uni-Vibe sounds, ranging from a slow phase-like sweep to a fast pitch-plus-timbre warble. The Vibrato setting has a more obvious pitch-modulation element to it but, again, sounds rather more complex than a straightforward vibrato effect. All this is controlled by a large Speed knob, plus two smaller knobs for adjusting Volume and Intensity. A mini toggle switch selects the modes and a rugged footswitch is used to engage/bypass the effect, with an LED to indicate the current status. Power comes from a 9V battery, or any Boss-compatible PSU that’s capable of delivering in excess of 100mA. The original Uni-Vibe also had a foot controller socket, but that’s omitted here. Designed to deliver more traditional phaser sounds, the Helix Phaser again offers two distinct tonal modes (Vintage and Smooth) plus a third TonePrint position. With controls for Speed, Depth, Feedback and Mix, it seems that the general aim was to enable the Helix Phaser to emulate just about any classic phaser device, serving up sounds from the rich and subtle to very obvious resonant sweeps at higher feedback settings. It certainly gets very close to those David Gilmour sounds, but its remit extends to covering just about any style of phaser you could imagine. I asked TC what models they’d referenced when designing the Helix and was told that inspiration was drawn from such models as MXR’s Script Phase 90, an old EHX Small Stone, a Mutron Phase II and one of the first TC Phase XII’s ever built. I’m not usually a big fan of phasers, but this one I like a lot! Once again, the audio path can be mono or stereo at both the input and output, and the dry sound remains in the analogue domain, while the processed path is handled by DSP. I was very fortunate in getting hold of these two pedals a few weeks before their official release date, but the downside of that was that the TonePrint software hadn’t then been updated to allow me to explore further editing or to download artist patches. Even so, the basic sounds of the two pedals are excellent, whether used in mono or stereo. The Viscous Vibe truly captures the character of the original without you having to pay a fortune for an analogue recreation, while the Helix is so much more musical sounding than the majority of phaser pedals I’ve tried to date, and with a much wider repertoire. The first-rate construction of these pedals also warrants a mention, as the custom cast-metal cases are very tough and the battery compartment is accessed via a very large recessed screw that, conveniently, can be turned using a coin. All the circuity is hidden away inside its own screened metal compartment to prevent accidental damage. The pairs of input and output jacks are all metal, and a mini-USB socket, next to the power inlet, can be used for editing or for firmware updates. Viscous Vibe & Helix £95 each including VAT. 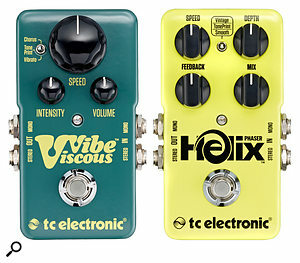 Viscous Vibe & Helix $129.99 each.